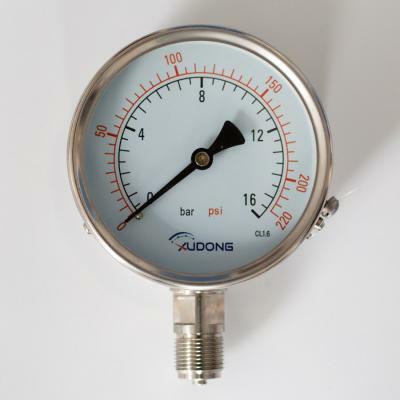 In the process of industrial process control and technology measurement, mechanical pressure gauge is widely applied because of the high mechanical strength of its elastic sensitive elements the feature of convenient production. The elastic deformation of the elastic sensitive elements takes place with the change of pressure. Mechanical water pressure gauges adopt sensitive components such as spring tubes, diaphragms, membrane boxes and bellows. The measured pressure is generally regarded as relative pressure, with atmospheric pressure being the reference. The elastic deformation of the elastic sensitive elements caused by the pressure of medium is amplified by the gear transmission mechanism of the water pressure gauge; the gauge shows the relative value (high or low), compared with atmospheric pressure. The pressure value -- in the measurement range -- is shown by the pointer, and the indication range of a dial generally expands to 270 degrees. The water pressure gauge can be divided into precise water pressure meter and general water pressure meter. The precision grades of precise water pressure gauge are 0.1, 0.16, 0.25 and 0.4, while that of the general water pressure gauge are1.0, 1.6, 2.5 and 4.0 respectively.